If you’re an alcoholic, you’re almost certainly going to be advised to attend Alcoholics Anonymous (AA) meetings. Some treatment and rehab centres insist on it, sometimes it’s a friend or family member who cajoles, threatens or, if you’re lucky, takes you along. So what is an AA meeting? The first thing is that while no two AA groups will be identical, they will all follow a basic format. This is because AA's Fourth Tradition is ‘Each group should be autonomous except in matters affecting other groups or AA as a whole’ which means that each group sets its own format, but will tend to use a basic template as laid down in the AA approved literature to start and end the meeting. Often what happens after the meeting is as important as what happens during it. Newcomers will find they are given a chance to stand and chat to other members of longer standing, those who are regular attenders and have a sponsor will be doing a similar thing: checking in with the person who has agreed to take them through the 12 Steps of AA so that they can master the underlying conditions that have led them to alcoholism. Questions can be asked in a less pressured environment. 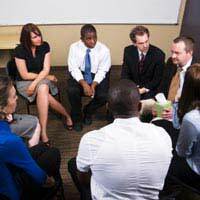 Many people are fearful of attending their first meeting, and fear is the greatest obstacle to recovery from alcoholism or any addition. The reason for AA’s existence is so that people who have had the same experience (alcoholism) can share their strength and hope (in recovery) and ensure that the are still on the path that keeps them sober. It’s not a process of learning from others who’ve been there before you but a sharing of experience, whether it’s your first meeting or five-hundredth, and a way of recognising that the negative emotions: fear, shame and guilt, which have led to alcoholism in the first place, have to be treated – they don’t go away just because you stop drinking. Feeling frightened, ashamed, terrified or threatened are normal – you will find that other people present will probably express exactly the feelings you are experiencing and how they deal with them.